Tesselated pavement, found at Southwell. 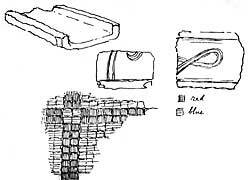 Sketch illustrating tiles and tesselated pavement. A VERY interesting discovery was made, in the early part of this year, in the gardens at the Residence, Southwell. 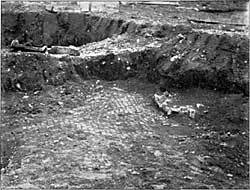 While engaged in lowering the level of a portion of the garden lying to the south of the house, the workmen found that the soil was all "made ground," full of fragments of stone, pottery, and bones, and at a depth of three or four feet below the modern surface they came upon a considerable area of tesselated pavement, once the floor of a large room or hall, and the foundation of one of the walls that bounded it. The pavement was of rude and coarse work, and simple in design, viz., square spaces of about eleven inches each way, composed of stone tesserae of a greyish blue colour, surrounded by a double row of red tesserae made of chopped-up tile, relieved by four of the blue tesserae at each corner of the square. The work can, with considerable certainty, be pronounced not to be Roman, and on the other hand all the circumstances point to its being pre-Norman in date. Probably some part of the domestic buildings connected with the Minster stood on this site, previous to the erection of the existing Norman Minster. Portions of a tesselated pavement remain in the south transept, under the old benches which run along its western wall, and the lower level of this pavement shews it to have belonged to an earlier church. 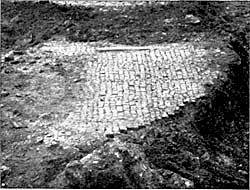 It is recorded that a tesselated pavement was dug up, more than a hundred years ago, just outside the eastern wall of the palace, and about thirty years ago some workmen in digging out the ground for a greenhouse stove in the garden of the house in Vicar's Court, then occupied by Minor Canon Tatham, came upon a tesselated pavement, about five feet underground, and two skeletons, lying on the pavement, and in a north and south direction, but unfortunately this pavement was destroyed without any drawing or description of it being preserved. It does not appear that any of these pavements at Southwell can be proved to be of Roman date. There were found in the Residence garden, along with the pavement described above, several large tiles of peculiar form, having both their edges turned up, and shallow ornamentation on their surfaces, which has a curiously antique appearance.